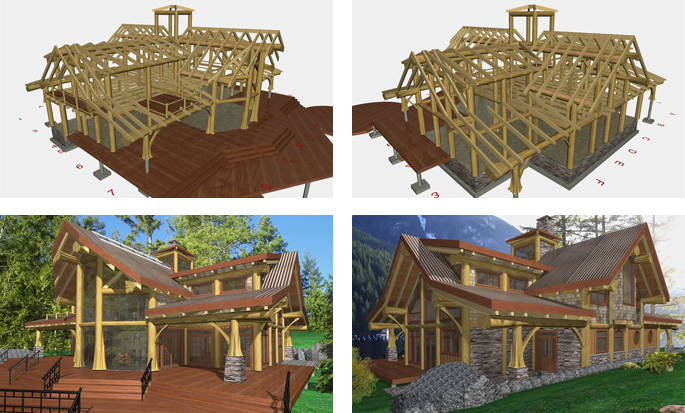 Here is where you will find more information about Log and Timber Frame Styles for your custom home project. Please click the + sign next to each style to see and read more about them. 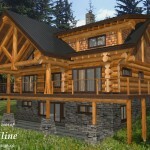 Using both log and timber styles, along with the use of interior stonework. 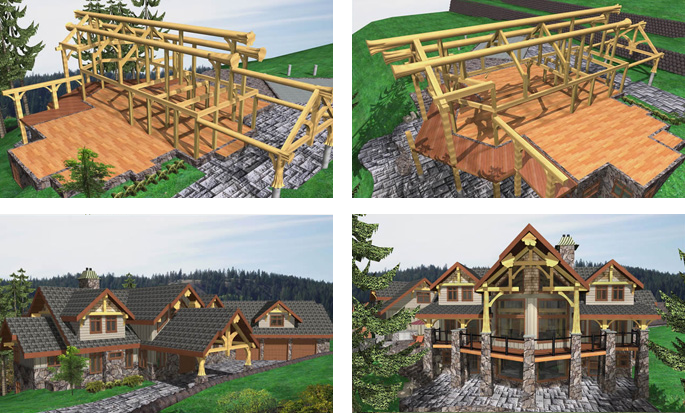 A union of post and beam and timber frame. 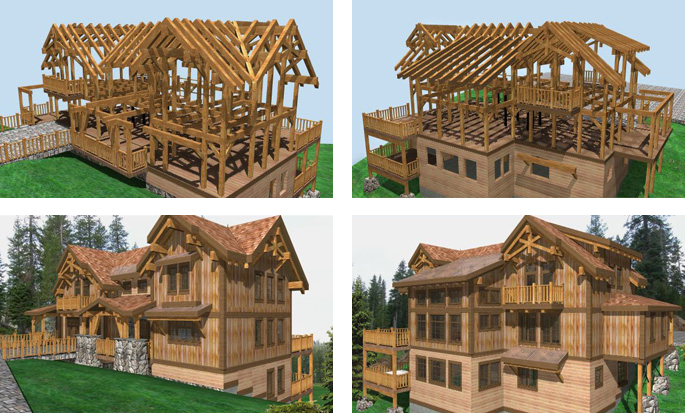 Timber framing is the modern term for the traditional half-timbered construction in which timber provides a visible skeletal frame that supports the whole building. Usually assembled in a series of bents, held together by horizontal members called girts. The timbers may be joined by traditional carved wood joinery or by metal hardware. 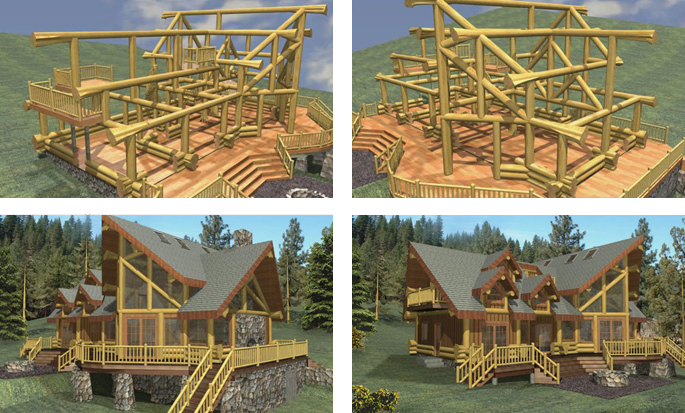 Timber frame is the construction of frame structures using large, heavy, wood members, specifically lumber 5 in. (13 cm) or more in the least dimension. The term implies stylistic features of a heavy nature. The heavy visible frames of interior and exterior walls are filled in with nonstructural material, typically 2x frame walls. Timber framing found its highest expression in the Tudor Style. The dovetail joint probably predates written history. Some of the earliest known examples of the dovetail joint are in furniture entombed with mummies dating from the first dynasty of ancient Egypt, as well the tombs of Chinese emperors. A system in which two upright members, the posts, hold up the beams which are laid horizontally across their top surfaces. This forms the main structure of the home with short lengths of horizontal logs forming the wall panels in sections between the posts. 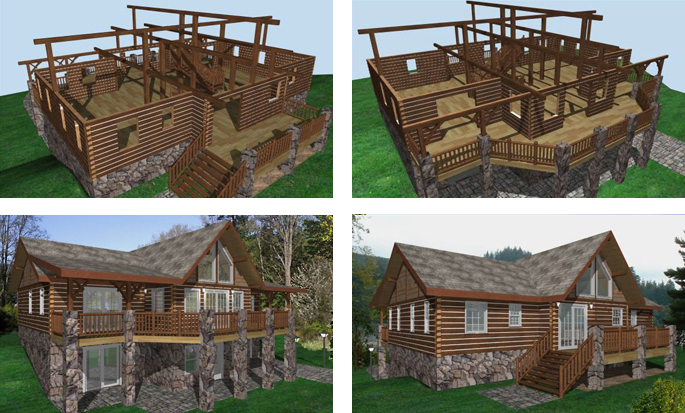 A home in which the structural framework is constructed of 2x bearing walls (conventionally framed) and logs are used in select locations as decorative accents (exterior and interior). Some select members, vertical posts and horizontal beams, may be used as part of the structural framework. Fusion or half & half is the union of handcrafted full-scribe and post & beam. This usually consists of two to three full-scribed bottom rounds supporting the upright members, the posts. The posts hold up the beams which are laid horizontally across their top surfaces. The spaces between the visible posts, bottom rounds and beams are filled in with nonstructural material, typically 2x frame walls. A system in which two upright members, the posts, hold up the beams which are laid horizontally across their top surfaces. Typically made of logs that have been peeled & de-limbed but are otherwise essentially unchanged from their natural appearance. The exposed logs form a structural frame and the beam must bear loads that rest on it as well as its own load without deforming or breaking. The spaces between the visible posts are filled in with nonstructural material, typically 2x frame walls. The logs may be joined by traditional carved wood joinery or by metal hardware. In Britain it is called post-and-lintel system, but in the U.S. “lintel” is usually reserved for a short beam that spans a window or door opening. 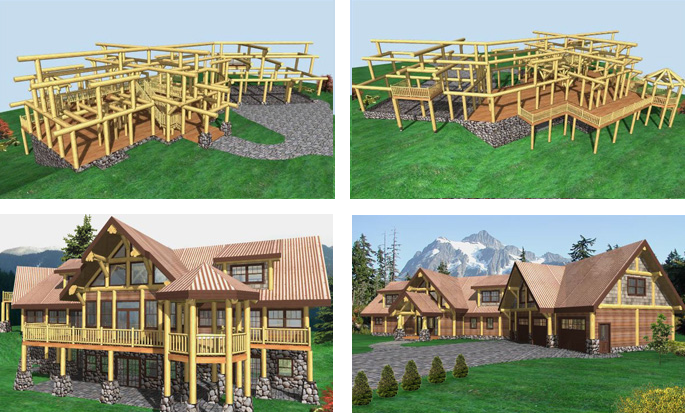 A milled or machine-profiled log home is one constructed of logs that have run through a manufacturing process to remove natural features and imperfections of the log and converts them into timbers that are consistent in size and appearance. 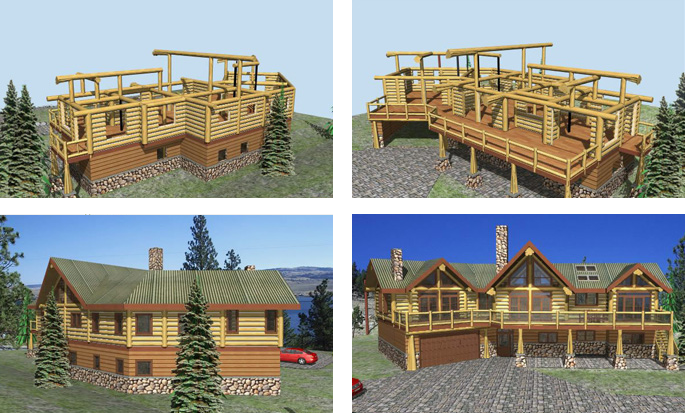 Milled log homes are often constructed with a variation of “flat-on-flat” with a tongue and groove joint in the laterals. In the 1920s’ the first milled log houses appeared on the market, using logs that were precut and shaped, rather than hand-hewn. 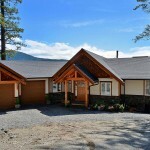 A handcrafted log home is typically made of logs that have been peeled & de-limbed but are otherwise essentially unchanged from their natural appearance. The more common handcrafted method is scandinavian full-scribe (also known as the chinkless method), where logs are scribed, custom fitted to one another, and notched where they overlap at the corners. 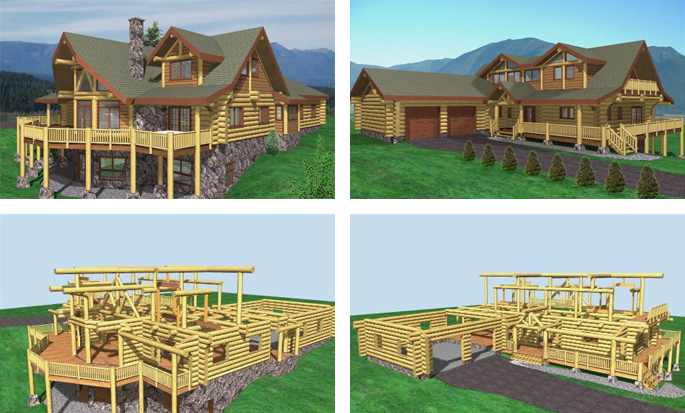 Handcrafted log homes have been built for centuries in Scandinavia, Russia and Eastern Euorope. The scandinavian settlers of Sweden brought the craft to North America in the early 1700s’, where it was quickly adopted by other colonists and Native Americans.